Join us for our annual Wo/men's Conference on Saturday, March 8, 2014. This year's theme 'We Can Do it!' is intended to bring women and men from all backgrounds together to explore creative ways to challenge injustice, racism, and sexism. 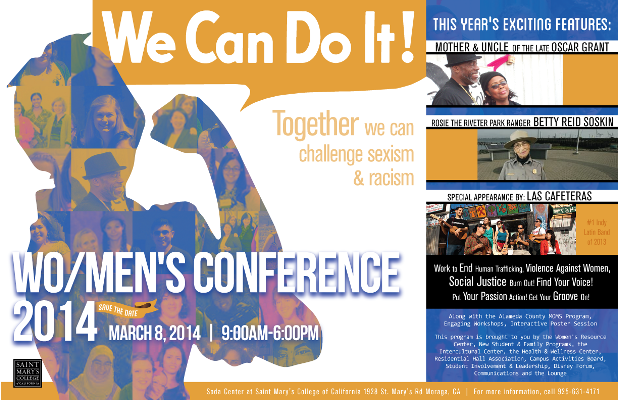 This year's speakers include the like of Wanda Johnson (the mother of Oscar Grant), Betty Reid Soskin (America's oldest park ranger who works fulltime at the Rosie the Riveter park at the age of 92) and grassroots social justice practitioners working in agencies ranging from Community Violence Solutions to the MOMS program in Alameda County. Additionally, there will be three tracks of workshops for you to participate in.